Add 2 tablespoons of olive oil to a large pan and saute the onions for at east 15 minutes, until they are soft and golden brown. Transfer the onions to a plate. 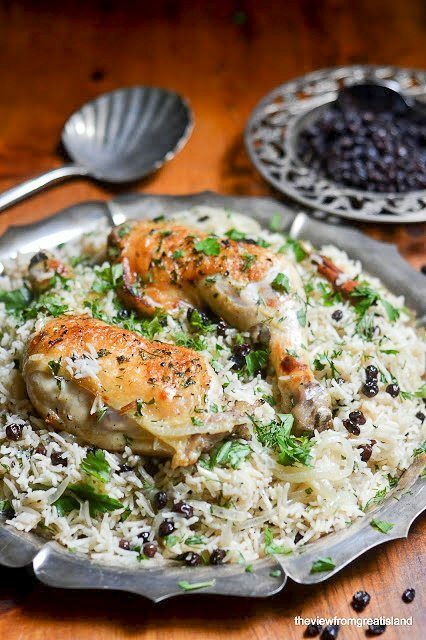 Put the chicken legs in a bowl and cover with the remaining 2 tablespoons of oil, the cardamom pods, cloves, and cinnamon sticks, a little salt and fresh cracked pepper, and massage everything into the chicken. Add the rice and onions to the pan, along with the currents. Add a teaspoon of salt, lots of fresh cracked black pepper, and stir well. Put the chicken back in and squish it down into the rice. Pour the boiling water over everything, and cover the pan. Cook for about 30 minutes on low, until the rice has absorbed the water and is tender. Turn off the heat, raise the lid, cover the top of the pan with a clean dishtowel, put the top back on, and let it sit for 10 minutes. Add the fresh herbs just before serving, and toss into the rice. Check the seasonings, garnish with a few more currants and herbs, and serve.